We keep getting little spring teasers (the sun is shining, cherry trees are blooming, not to mention every store in the mall has their entire spring lines on display), yet spend 5 minutes outside and you’ll know it’s still winter in the Northwest. ARGH! They add so much warmth and interest to your outfit, don’t you think? On the right the plain checked shirt with the boring blue jeans is not cute, especially paired with these tennis shoes! On the left, I’ve replaced the faded jeans with my dark skinny jeans- traded the tennis shoes for the brown boots, unbuttoned my shirt a few buttons and then added this cute cardigan (that I actually have on backwards). 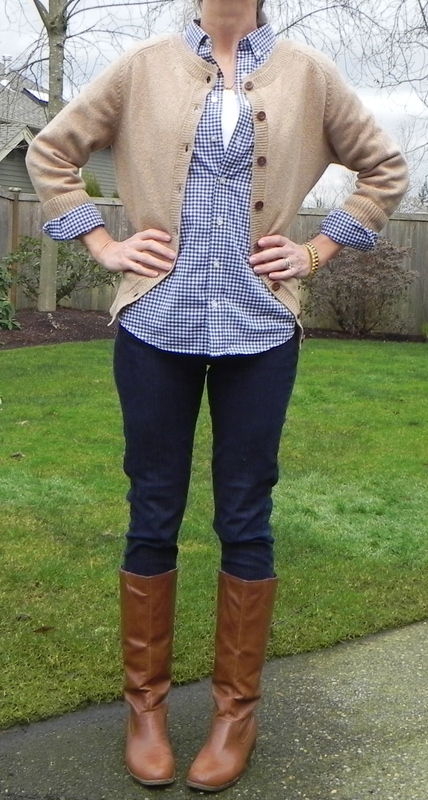 I think it’s a cute, easy outfit for volunteering at school today! By adding the layers (tank underneath and cardigan over) I've made a much cuter and warmer outfit! You inspire me every day to try a lot harder to put myself together! I love your rule of 3’s! I still find I wander the stored in search of something as cute as you pull off! Thanks! I love this look. You pull it off really well. You make me want to wear my riding boots more often! You hit the mark! Fit great, boots, perfect, print, FUN! Thank you so much! I’m glad it helps. I used to live in the UK (Windsor) I loved it. I used to shop at Marks and Spencer, Daniel’s and John Lewis…I miss those days! The weather here in Seattle is very similar to the UK. Cold and dreary! UGH! So I consider that YOUR compliment Megan. Because no way in heck has anyone ever ever said such a thing to me. Normally I look like your before pictures LOL. Thanks so much for taking the time to write- you made my day! Found you from Fashion Friday — and this outfit caught my eye. I LOVE it – and will absolutely try recreating it myself. Thanks for the inspiration! Thanks, it’s so simple, yet I like the easy comfort of it!